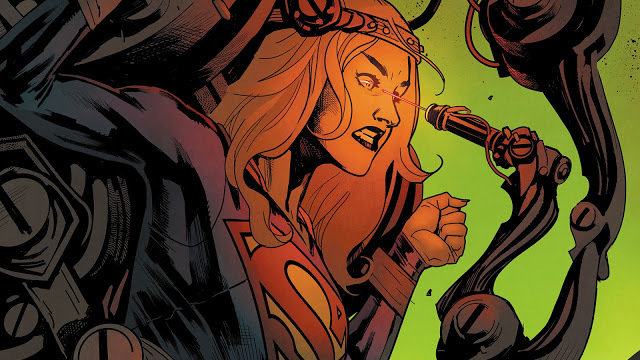 Supergirl has turned a corner after the previous creative team left. However, after starting with such a strong lead, it has stagnated. Don’t get me wrong, I still like the book quite a bit. However, it doesn’t really feel like a lot has happened. Sure we know that Kara is on a quest and she found a former Guardian was involved in Krypton’s death but it’s been several issues since then and I can’t say we are any closer to progressing this story. 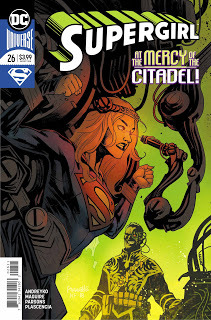 Instead Kara met “Totally-Not-Starlord” Zn’dr and went to the ruins of Krypton and got captured. I just want more from this story. I’m even enjoying the stuff that doesn’t go anywhere. It’s interesting and well written but without that substance it feels… flat. Let’s just jump into this new issue and hope that things change for the better. We catch up with Kara as she awakens. She is being restrained and it seems her captors have taken a sample from her. She is now face to face with Harry Hokum. He attempts to get information out of her before she spits in his face. Kara think of a plan to escape and begins to agitate Splyce. Eventually, Splyce gets sick of Kara’s talking and hits her with a powered blow. Kara is then transported to a prisoner transfer. She acts as though she is still unconcious from the attack. Meanwhile, back with Zn’dr and Krypto, the two are suddenly jumped by two hooded men. They have the drop on them and are forced to go with them. At the prison, Kara is roughed up a little by the guards before being thrown in with a group of women and children. The guards have stopped feeding them and many are sickly. Now that she has her chance, Kara uses the powers that she has after being powered up by Splyce. She sets out to free the prisoners. We catch up with the guards of the prison who are talking amongst themselves before they are attacked and killed by an unseen assailant. Back with Hokum, we see that he is using Supergirl’s cells to attempt to breed new kryptonian children. We catch back up with Supergirl as she springs her plan into action. She quickly incapacitates the guard before she is suddenly stopped. An explosion rocks Kara and when she raises her head she sees none other than the Omega Men. Luckily, their leader recognizes Kara and she informs them that the people that are with her are innocents. Their leader then extends his hand toward Kara and flashes images into her mind. She realizes that many of them are in the same boat that she is and she agrees to help them. The group fights through the prison until they suddenly come across some friends of the Omega Men. Several friends that they believed to be dead were there with no explanation. We then cut to see Splyce with a small army looking to kill all the intruders except for Supergirl. This is where the issue ends. So, again, this issue continues down the same path as the previous ones. Sure, it’s fun and entertaining. I like a fun space adventure. However, nothing in this issue really pushes the main plot forward at all. We continue down this side plot which, while interesting, hasn’t been revealed to have any bearing so far. The appearance of the Omega Men was fun but as someone that hasn’t read that series, I was a bit lost. That all being said, I don’t hate this issue. It’s a fun space adventure, how bad can that be? Sure, there are some cringy moments in this issue that I felt were kind of out of place but I was able to move past them rather easily. How can you hate an issue that is fun even if it doesn’t do much for you? I know I certainly can’t. Supergirl continues to move as far from the main plot as possible but its hard to criticize when the issue is just so much fun. Think of those old sci-fi adventure films you used to watch as a kid. This issue feels exactly like that. I had so much fun reading this issue that I can’t really be as harsh as usual on it. I’m a simple man. If something is fun, I’m going to be a little more lenient on it. That’s just the way it is.